Applies therapeutic acupressure to your heel, reducing pain caused by heel spurs, plantar fasciitis, shin splints, tendonitis, and other disorders in an all-natural way. Sold in a pair fitting women's shoe sizes 6.5-10 and men's 5-8. Made for daily wear and utilizes our unique and patented Fascia-Bar technology, developed by doctors and clinically proven effective. Most people experience pain relief within 1-8 days of regular use. Say goodbye to the pain, and hello to a more active you. Re-aligns the plantar fascia ligament that spans the sole of your foot back into a healthy position and re-cushions the natural fat pad of your worn heels forming a new layer of support. Gives multidirectional support with 360 degree motion control and improves your posture so that you look and feel better standing, walking and running. Trusted by Pro NBA players like John Starks & Jason Kidd for heel pain relief. Fits easily into any closed heel shoe such as tennis shoes, athletic or running shoes, cleats, work boots, and other sneakers. Machine washable for easy cleaning. Made of Soft Kraton material that prevents slipping and sliding inside your shoes, and also repels sweat, moisture, and bacteria. We are a US company and we love to help our customers. Heel That Pain products are 100% guaranteed and come with a 120 day "No Questions Asked" Manufacturer Return and Refund Policy. If you are in between sizes and have a wide foot we recommend the larger size. If you have a smaller and narrower foot we recommend the smaller size. 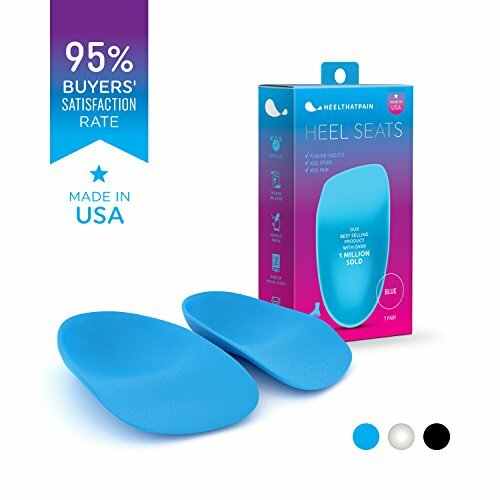 Blue, Black, Pink, Purple, and Tan Heel Seats may initially feel firmer than other products. Clear are medium firmness. For sensitive feet, try our Gel Heel Seats.